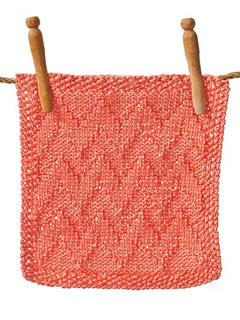 This is a very nice book with some nice washcloth patterns. I especially like it because I’m a relatively new knitter and my knitting skills are still a work-in-progress (I’m not ready for the TKGA Masters program by any means, yet!). 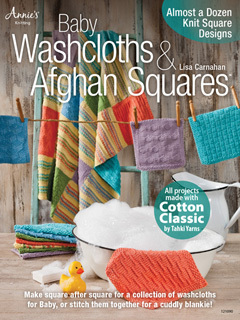 The washcloths in this book were made with Tahki Yarns Cotton Classic, which is a DK weight yarn. Since I didn’t have any of that yarn, I used some Omega Sinfonia that I had left over from the “Wiggly Crochet Dishcloths” book I did for Annie’s. I LOVE this yarn! 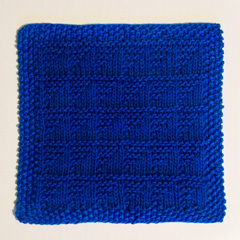 It’s a sport weight 100% cotton yarn that comes in many gorgeous colors. It is 3.52oz (100g) and has 218 yards (200m) for $4-5, so the value is good (and you can buy it for even less than this with a coupon!). I started knitting a pretty pink sweater this month from 5 balls of Sinfonia that I bought on sale for $3 each to learn more about knitting and shaping sweaters! It should be really nice! What do you think? I think I did pretty well for being a new knitter (since July of this year). 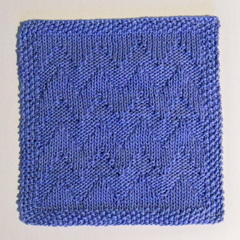 You can see larger photos of all the washcloth blocks in this book and purchase it online on the Annie’s website here. 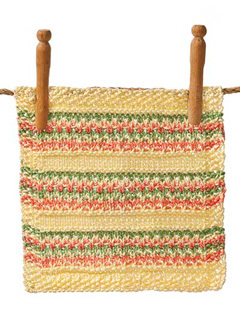 If you love to knit washcloths and dishcloths, you’ll really enjoy this book! 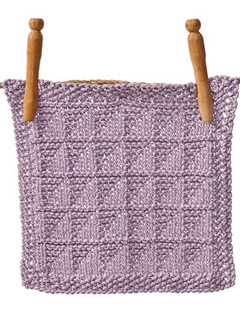 This entry was posted in Book review, Knitting, Yarn review and tagged knitting, knitting book, patterns, yarn. Bookmark the permalink. This looks like a great book for beginner knitters or someone like me that needs a brush up…I just found Sinfonia cotton at my “big” JoAnn’s. Can’t wait to try it.